sugar – You Asked It! Making candy is the science of cooking sugar. Success depends on many factors. Use a heavy saucepan with metal that conducts heat, such as aluminum. Use a big pan to prevent boiling over. This is especially true if using molasses. The pan should fit the burner or be just a little smaller than the burner. This keeps the pan sides hot and reduces crystal formation. Heat and stir the mixture over low heat to dissolve all sugar crystals. Before the target temperature is reached, brush pan sides with water to wash sugar crystals back into the syrup or put the lid on the pan for steam to melt sugar on pan sides. Once sugar is dissolved, attach a candy thermometer inside the pan and do not move it. Once desired temperature is reached, do not scrape the pan or put a used spoon in the mixture. That will cause crystal formation. 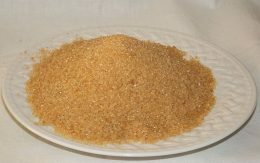 Raw sugar is a trendy sweetener found in many specialty food stores. Examples include Demerara and turbinado sugar. They have a light molasses flavor and a larger crystal size. Can they be used in place of traditional granulated sugar in baked goods? For wetter batters, such as cake batter, the moisture in the recipe can help dissolve the raw sugar to produce a good cake texture. For a dryer batter or dough, such as muffins, cookies and shortbread, the finished texture is poor. The low amount of moisture will not completely dissolve the large sugar crystals. 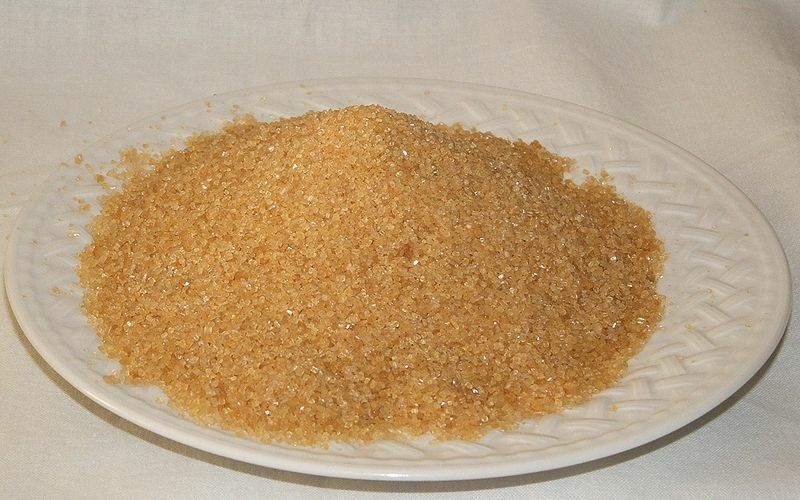 To use raw sugar in baked goods, grind the sugar until fine and powdery before adding to batters. This will help the sugar dissolve and improve results. The data backs the message. Sugar-sweetened beverages contribute calories and added sugars to the diets of U.S. children. Studies have suggested a link between the consumption of sugar-sweetened beverages and dental caries, weight gain, type 2 diabetes, dyslipidemia, and nonalcoholic fatty liver disease in children. The 2015–2020 Dietary Guidelines for Americans recommend reducing added sugars consumption to less than 10% of calories per day and, specifically, to choose beverages with no added sugars. Almost two-thirds of U.S. youth consume at least one sugar-sweetened beverage a day. Calories from sugar-sweetened beverages increased with age for both boys and girls. Boys consumed an average 164 kilocalories (kcal) from sugar-sweetened beverages, which contributed 7.3% of total daily caloric intake. Girls consumed an average 121 kcal from sugar-sweetened beverages, which contributed 7.2% of total daily caloric intake. What is Cultured Corn Sugar? As “natural” foods grow in popularity, food manufacturers look for ingredients to fit the “natural” claim. To prohibit mold growth, the use of cultured dextrose can be used. This sugar powder is fermented. Then it is used in combination with other preservation methods such as modified atmosphere packaging, bioactive packaging and high pressure processing, and bacteriophages. They can be use a variety of foods such as dairy products, salad dressings, ready-to-eat meals, cured meats, and baked goods. One manufacturer of this product is Danisco.